by locals. Our results have implications in future policy making. Forest products play a key role in supporting livelihoods (Mulenga et al. 2014) and poverty alleviation (Angelsen and Wunder 2003). The most recognized ways are: (1) by complementing current consumption, in the form of seasonal gap-filling and supplements to other incomes, and (2) by providing valuable safety nets in time of emergency, as reservoirs for auto-consumption, or as sources of quick cash in hard times (Angelsen and Wunder 2003). Billions worldwide make use of non-timber forest products for food, medicine, building material, fuels (Mulenga et al. 2014), or as cash income (Mamo et al. 2007). One important non-timber forest product is wood fuels, understood as minimally processed firewood, charcoal and other solid fuels derived from lingo-cellulosic material (FAO 2000). In the world, more than three billion people rely on this type of solid fuel, particularly in developing countries; empirical research focuses predominantly on African (Mamo et al. 2007; Legros et al. 2009) and Asian countries (Démurger and Fournier 2011; Soltani et al. 2014). Latin American cases, even though at least 83 million people rely on firewood and other biomass as their primary fuel for cooking (Bailis et al. 2012), are not that well-documented. In this context, energy poverty plays a significant role in locals’ livelihoods. It has been defined by the International Energy Agency as the lack of access to electricity and reliance on traditional biomass fuels for cooking (Jones 2010). The connection between poverty reduction and energy has been established, highlighting the necessity to improve locals’ energy access to achieve the Millennium Development Goals (Sovacool 2012). In so doing, sources of energy can be arranged on a ladder, with the simplest or more traditional fuels at the bottom (as woodfuels, dung and crop residues), to more advanced or modern fuels (as gas and electricity). With increase in income and prosperity, people gradually advance on the “energy ladder” (ibid.) with positive health effects (Smith et al. 2005), reduced atmospheric emissions (Yevich and Logan 2003), and changing forest cover (DeFries and Pandey 2010). The actual choice of combustion, however, does not solely depend on price and income, but also on tradition, social expectation and availability (Barnes et al. 2005). Since there are currently many people at the base of the ladder, and is expected an increase in firewood consumption in the following decades is expected (Rehfuess 2007). Adding an environmental perspective, Latin America has the highest rate of tropical forest loss due to agrarian frontier expansion and deforestation in the Great Chaco (Argentina, Paraguay, and Bolivia; Hansen et al. 2013), having not only a high environmental impact, but also far-reaching implications for firewood consumption in the region. 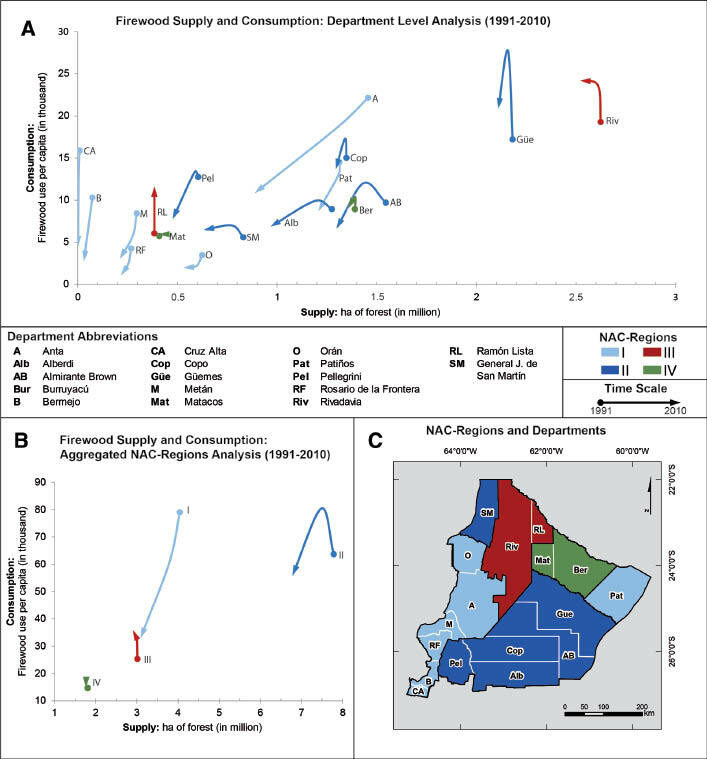 Therefore, for first time in the region, we explore the links between agricultural expansion and firewood consumption in the Northern Argentine Chaco (NAC), highlighting new dependencies between global and local processes, and visualizing future regional development trends. In traditional research it is assumed that firewood consumption affects forest cover in the form of degradation and deforestation (Démurger and Fournier 2011). Forests in the NAC have been traditionally seen under communal tenure (Altrichter and Basurto 2008) and firewood as a common-pool resource (CPR) for locals to survive. What firewood has in common with other CPR in the region (such as groundwater basins, fisheries, wildlife) is subtractability, i.e. the good is not available anymore when taken from the common pool, as well as the high costs of excluding other potential users (Ostrom 1990; Ostrom et al. 1994). Taking those two attributes into account (subtractability and cost of exclusion), we argue that firewood CPR management takes place on a local level, depending on a set of factors, such as users’ (long-term) dependence on the resource, and levels of autonomy of informal decision-making (instated due to lack of control and law enforcement in the NAC) in order to make the appropriators’ own access and harvesting rules (c.f. Ostrom et al. 1994). Furthermore, the functioning of the NAC firewood CPR system has benefitted from large areas of (relatively) undisputed state-owned territory and the limited interest of large-scale actors to change the form of value-creation. Nowadays the assumption that a significant portion of deforestation is explained by the locals’ use of firewood is highly contested (Geist and Lambin 2002); there is a more influential driver of deforestation identified: agribusiness (ibid.). In Latin America, 68% of total deforestation is owed to this driver, much higher than in Asia and Africa (35%; Hosonuma et al. 2012). This development leads to the creation of contested territories and natural resources. Scale is an important characteristic here, as CPR firewood is consumed locally by locals, satisfying local needs for combustion. However, access and availability of forest territories are increasingly restricted and substituted by agricultural commodities exported and commercialized on global markets, aiming to cater for the global food and energy demand (Maass et al. 2005); new global-local interplays and dependencies occur. In this context, firewood as a CPR is being contested not just on the local level and in traditional forms (such as actual exclusion by constructing fences or via locals’ competition for the resource firewood), but more so by firewood elimination and subtraction by more profitable agribusiness-goods. This trend has been facilitated by lack of legal clarity on the use of state-owned territory, indigenous land and property rights of peasants living in those areas and then favoured by increasing formalisation of land tenure or 99-year leasing contracts of public forests to private companies (as happened in the case of the territories of the state company “Salta Forestal”, Salta Province, Argentina). Thus, in the context of agribusiness in the NAC, where global demands are currently prioritized over local needs, the local population is faced with limitation of and access to CPRs (Angelsen and Wunder 2003). As a result, current demographic, socio-economic, and technological changes are beginning to threaten the long-term sustainability of CPR and thus locals’ livelihoods (D’Alisa 2013; cf. Ostrom 1990). Although being highly topical, researchers on the commons consider those changes as sidelines (Agrawal 2007). (a) Transformation: The first dimension deals with materialization of change in a particular territorial setting. Here, the identification of bio-physical variables subject to alteration lies at the foreground. In our case, the most visible attribute is related to deforestation, diminishing the actual surface of forest land, but also creating new spaces of agrarian production. This dimension does not necessarily imply an explicitly normative perspective, but rather focuses on the visualization of territorial processes of change in situ. (b) Modification of rules: Based on transformation, the second analytical dimension focuses on the normative perspective of change. Often, appropriation and elimination of CPRs are based on the modification of legal and administrative settings. In Argentina, the increasing commoditization of land and expanding agriculture frontiers (mainly for soybeans production) has led to its progressive privatization and foreignization (Goldfarb 2012); as well as special adaptations to territorial planning and protective zoning of forest land.1 In this sense, the role of the state is important not only as an enabler (of agribusiness activities) but also as a disabler (of e.g. CPR use in protected areas). Local-level (communal-informal) rules, often in connection with indigenous rights, are then overwritten. Although not explicitly analysed in this paper, indigenous land rights began to be recognized by national legislation (N. 26,160 in 1996). These important political change leads to modifications in property situations and contested territorialities with other actors (particularly peasants and new agribusiness actors’ search for commodification of land). (c) Consequences of new global-local interplays: The last dimension lays its focus on the farther-reaching consequences of bio-physical transformation processes and modification of rules. In Latin America, extra-regional and globalized actors play a significant role in terms of exclusion of locals and hoarding of CPRs (Teubal 2009; Araghi 2010), being the land grabbing phenomenon its clearest expression (Borras et al. 2012). Thus, conflicting interests over, strategies for, and actions related to forest land are brought together to evaluate the relevance of forest-related CPR. Since we are dealing with a frontier of expansion of agribusiness and predominantly extra-regional control, the clash between global and local demand for the resource (forest) land is even more pronounced. Further in this article we appeal to the contributions of the geo-history to interpret our results. In this sense we understand, following Braudel (2001), that the role of history is essential to explain the geographical space and vice versa -considering that historical facts always have a “space” starting conditions, which explain further development-. Therefore to explaining space, time is the necessary complement, and vice versa. The complex dynamics and logics between space and time, between the processes of regionalization and periodization, and between different time speeds in different spaces have been analysed by historians and geographers as Braudel (2001/1949), Haesbaert (2002) and Grataloup (2006) among others. These interpretations reveal the anthropogenic dynamics of space in its historical development, where today and yesterday leave their marks in the territory, and where we can appreciate the values, ideas and beliefs of different societies, associated with a certain space conditions. This framework of interpretation does not obviate the consideration of economic and political factors -current and historical-, which are essential for understanding the future of the territories. Thereby, in this article we use the cited dimensions to the analysis of the evolution and consequences of the satisfaction of global demands over local’s ones in the NAC over two decades, from 1990 when soy-agribusiness became relevant, to 2010. In this sense, we propose a regional classification of the NAC territory exposing the different situations of convergence that we believe can be explained by the socio-historical processes that took place. Based on Braudel’s (2001), Haesbaert’s (2002) and Grataloup’s (2006) concepts of the intersection between geographic space and time, our classification will then be scrutinized according to possible periodization of regional development patterns, where regions transition towards agricultural exploitation through deforestation, with the effect of low consumption and supply of firewood. This new form of visualisation and combination of data allows for a future outlook and thus, by including forest zoning, provides a vital basis for future policy making. The Great Chaco extends over Bolivia, Paraguay, and Argentina, occupying more than one million km2. It represents the second-most important forest area of South America behind the Amazon (Dinerstein et al. 1995). Argentina’s share covers about 650 million hectares, more than half of the total eco-region (Figure 1A). It includes forest of deciduous species, shrubs in saline soils, floodplains and lagoons, and is a carbon reservoir important for global climate regulation (Gasparri et al. 2008). (A) Location of the North of the Argentinean Chaco (NAC) Study Area. (B) Department view of the Study Area. Cartographic sources: TNC, INDEC. The NAC, our study area, spans over parts of five provinces (Eastern Salta and Tucumán, Western Formosa and Chaco, Northern Santiago del Estero; Figure 1B), covering an area of 176,000 km2. In 2010 it accounted for 550,000 inhabitants, resulting in a very low population density of fewer than 3.1 inhabitants per km2. In addition, 42% of the total population lived in small towns of more than 2000 residents. 68% is made up of rural population (predominantly indigenous people and cattle breeders, so-called criollos) with highly dispersed settlement patterns in the forest. The region has the highest proportion of indigenous population (more than 50%) in Argentina (Cervera-Novo 2010). The livelihood conditions of these people are critical, showing the highest poverty levels nationwide (Longhi 2014). This aspect is particularly relevant since both indigenous groups and peasants are the biggest users of CPRs (such as food, fibre, medicines, fodder, and wood; Leake 2010). Their livelihoods are supported by wage labour (predominantly public employment), crafts sales, and government-funded social plans (Gordillo 1995). The land tenure structure in the NAC is very unequal: Extensive areas are under state control (i.e. public lands), large commercial estates (i.e. latifundios), indigenous and communal lands, and other lands without defined borders, where the tenure situation is very irregular. For the last hundred years, peasants have occupied lands (public and private) in the NAC, while at the same time these territories constitute indigenous communities’ ancestral territories (León et al. 1985; Carrasco and Briones 1996). However, during the last decades, Argentina has experienced the expansion of agribusiness by soybean crops to satisfy global demands. The country ranks third as the world supplier of soybeans, with more than 90% of total production destined to international markets (Regunaga 2010). Thus, soybean-exports are fundamental for the country’s balance of payments. In 2014, the production amounted to approximately 50 million tons of soybeans, planted on 20 million hectares, and representing a national income of USD 24,051 million (Calzada 2015). Although the soybean production in the NAC is marginal on the Argentine national level, soybeans represent the main crop in the region accounting for half of the productive land (i.e. one million hectares) (Paolasso and Krapovickas 2013). Very high conservation value (red): In these areas it is not allowed to deforest or remove wood. High or medium conservation value (yellow): Deforestation is prohibited but sustainable use, such as silvo-pastoral projects, tourism, and gathering is allowed. Low conservation value (green): There are sectors that may be partially or completely deforest. A prior execution of an environmental impact assessment is necessary. However, the application of the law shows many weaknesses. The zoning maps were often compiled without considering scientific data available, the public participatory debate necessary was not appropriately conducted, and particularly in the NAC provinces indigenous communities and criollos were insufficiently incorporated (García-Collazo et al. 2013). In some cases, forest zoning does not take into account traditional territories, communal property and free-access resources. Additionally, the law is currently circumvented in the NAC, changing the zoning maps according to the convenience of business activities (cf. Seghezzo et al. 2011). Precisely those territories experience tension in relation to CPR appropriation by local vs. global agents. It is estimated that about 164 land and environment conflicts are focused in the region, 89% of which have been initiated since 2000 and thus coinciding with the big expansion of agribusiness and increased deforestation (Redaf 2010). Our analysis focuses on the study of change over the past two decades (1990–2000 and 2000–2010). The methodology is summarized in Table 1. For further interpretation of our quantitative results, we include field observations and semi-structured interviews (conducted in 2013 and 2014) with firewood users in the NAC. Firewood consumption National population census 1991, 2001, and 2010. Field observations and interviews with firewood users in the NAC. Descriptive statistics. Relative and absolute number of households and people who use firewood and charcoal as energy source for cooking. Firewood supply 8 Landsat™ images (30 m). Poverty Dirección Nacional de Estadísticas e Información de Salud (National Ministry of Health). Land use trends Maps on forest zoning.ii ArcGIS 10.2 Creation/aggregation of a unified forest zoning map of the region. iWe used the CMRM-index because of its advantages compared to indices traditionally used to study poverty in Argentina (e.g. Unsatisfied Basic Needs Index) (cf. Longhi 2014). iiWe thank the Instituto Nacional de Tecnología Agropecuaria (INTA) and Fundación ProYungas for providing zoning maps in shape-file-format. Data analysis: For better comparison we used relative figures to analyse regional tendencies of households’ firewood consumption and forest availability (in ha) per household. According to the three datasets available we calculate and categorize change; four distinct NAC regions were the result. An interpretation on the development of those regions and subsequent consequences for the local population are carried out by focussing on the newly created forest zoning maps. In the NAC, the use of firewood for cooking has been and still is of major significance, even though it is observed that the quantity of persons using firewood has decreased from close to 200.000 persons (59% of total population) in 1991, to 155.000 persons (25%) in 2010 (Figure 2). Nevertheless, if we consider 2010s average of firewood users at the national level (barely 3% of the total population), firewood in the Chaco region is of great significance. 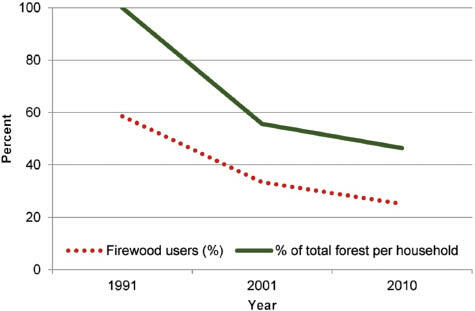 Change in firewood consumption (percentage of households using firewood) and forest area (1991 – 2010). Forest area is expressed as hectares of forest per household, and represented as relative values (base: 1991 as 100%). Data sources: Landsat™ (1991/1992, 2001/2002, 2007/2011); INDEC (1991, 2001, 2010). The evolution of the forest area in the NAC is important when we investigate the use of firewood. Considering our three dimensions of analysis the access to the forest for locals is increasingly restricted, which is also reflected in their perception. Transformations, and its effects, are highly identified through deforestation: “The most profound deforestation has occurred over the last 10 years. There is no more firewood in the area. In the past, we used firewood at school, but due to this problem, the school had to install a gas tank” (principal of primary school, 50 years, Garmendia, Tucumán). Modification of rules is the second dimension and a worry for locals. Interviews show an increasing concern about the access to firewood in places where forest is available, but with access restrictions. “You can still see people with their carts looking for firewood (…) but [their success] depends, because sometimes they do not let you enter [the forest] when it is private property” (municipality employee, 40 years, Las Lajitas, Salta). “[T]here is fields everywhere. Before, it was all forest and you could walk through, but now if you enter in some fields, they can fine you” (unemployed man, 45 years, JV González, Salta). Both situations, transformations and modification of rules, often impulse the response of local people in defence of their territories and forest, as the Movimiento Campesino de Santiago del Estero- Vía Campesina (MOCASE VC), a peasant movement founded in the 1980s. “[The movement arose from] the fight for land and our necessities. Today, what affects us most … are the [agribusiness] companies, that even out the path to appropriation and sale of state-owned land. (…) But we have a different view, a form to feel for the land, for the nature, which is different. And that is what our fight is all about” (MOCASE activist, 35 years, Monte Quemado, Santiago del Estero). Implicitly, the global-local interplay – our third dimension – becomes visible here. Underlining the locals’ statements with absolute figures, the region has lost more than two million hectares of forest over the last 20 years. Available forest per household fell 57%, from more than 230 to 100 hectares (Figure 2). The intimate and almost directly proportional relationship between forest and firewood use is highlighted. More often than not, due to the lack of forest available, households that were used to cooking with firewood are now driven to change their form of combustion or complement it with the use of more expensive liquefied petroleum gas. The analysis of Figure 2 allows us setting up a scenario when forests are no longer available and gas subsidies as well as social programs are reduced. Complemented by results from in situ interviews it comes without saying that households’ financial resources are redistributed, shrinking the capital for alimentation, education, health care, or clothing, fostering a downward spiral and deterioration of local livelihoods. “I prefer living in the forest (…) because I am not touching my pockets, (…) I have 200 pesos and they are kept there. (…) You hunt a rabbit, a deer and you live off it. In the wild you do not buy firewood, … quietly you collect it and you have it for cooking … that is the countryside” (peasant, 50 years, Juan Solá, Salta). The dependence on the forest and firewood is thus clearly visible. “Without the forest, we would not exist! We would lose as much as the reason of being Chaqueños!” (veterinarian, 35 years, La Unión, Salta). In this context it is important to understand that our data source (National Population Census) underestimates the actual firewood consumption (Esper 2001). Also, statistics available do not make any differentiation whether access to the good is via proper collection or purchase. Furthermore, census data does not allow the interpretation whether the decrease of firewood consumption is owed to the increasingly restricted access to forests in combination with deforestation, or if is due to the access to other fuels and an improvement of livelihoods. Nevertheless, in situ evaluations have shown that the restriction to forest access is of major concern. Moreover, in the more remote areas with lack of access to other fuels like natural gas pipelines or liquefied petroleum gas (subsidised or not) the sovereignty of decision to use other fuels is not lying in the hands of locals themselves. The possibility of change to other forms of combustion and moves up in the energy ladder, vary greatly on sub-regional and local levels, depending on context-related (political) situations and power networks of actors. In the NAC, three drivers influence the decision on the type of energy source used. The first factor is economically driven and highlights the relationship between fuel prices and households’ income. Here, two foci are seen: the decision and influence on resource pricing, and the subsidy of the overall income to facilitate household decision making. Considering the first (i.e. resource pricing) firewood – though on the lowest step of the energy ladder – is the most economical heat source in the region (Luna 2010). Liquefied petroleum gas offers more advantages (e.g. cleanliness) but is sold – if available at all – at a three to fivefold price in rural compared to urban areas. Thus, rural but even urban families combine two fuels when they need saved money. For example, compared to 10-kg liquefied petroleum gas which cost about 100 to 160 ARS and last approximately 1 week when used by an average household, one horse-carriage of wood amounts to 90 ARS but can sustain up to a month in winter and 2–3 months in summer. The third fuel source – ranked highest on the energy ladder – is based on natural gas pipelines. They are more economical than gas containers and firewood (if bought), but the pipeline network in the NAC is insufficient and thus does not play a role in households’ decision making processes. A government incentive programme (called Garrafa Social) targets the use of better sources of combustion, encouraging the use of liquefied petroleum gas. As a result, a 10-kg gas container can be purchased at the low price of 16 ARS per unit. However, the quantity of the containers is not sufficient and the distribution prone to corruption. “The ministry had the containers sent, but here it is in the hands of the business [that sells the containers]. You take off the [commercial] label and underneath it says Garrafa Social. How does that work? Its price should be 16 ARS and they sell it at 125. (…) And we have to buy it; there is nothing we can do…” (peasant, 50 years, Juan Solá, Salta). Considering the second focus (i.e. household income) other government welfare benefits (e.g. Asignación Universal por Hijo, i.e. financial support paid per child) target the increase of spendable household income. Thus, these programmes do not interfere with market pricing of combustion alternatives but focus on the improvement of individual decision-making powers. Both policies (focused on the pricing of the resource and on the household income) have improved the access to liquid petroleum gas, promoting the ascended on the energy ladder. The second factor, culture and traditions, also plays an important role in the NAC. Interviews have shown that even though liquefied petroleum gas is closely connected to the positively perceived notions of progress, practicality, and cleanliness, firewood is still preferred. “In my house, it is fire every day. And if they could install gas, my mother would still use firewood, because she likes it. She is the one consuming firewood” (municipal worker, 40 years, Las Lajitas, Salta). Tradition and “the special firewood-flavour of meals” are highlighted. Some particular dishes, especially those that take longer cooking time are usually made over firewood. This is observed both in rural and in urban spaces (Luna 2010). Changing regional settings and frameworks are the third set of influencing factors of firewood consumption patterns. The NAC is in the process of major transformations from being disconnected from economic globalization processes to becoming a globalized frontier of agriculture. Agrarian expansion (particularly in the southern, western and south-eastern parts of the NAC), has led to privatization and land concentration. Subsequent land use changes disfavour the Chaco woodlands. In this context particularly modifications of rules occur. First, power relations between private farms and the local population are altered. New private farms do not allow locals to access their land in order to extract firewood from privatized – often non-exploited – woodlands; trespassing charges and fines have been registered in relation to the attempted (small-scale) extraction of renewable resources. Second, new conflicts arise due to public surveillance and control of CPR extraction and commercialization of firewood, often criminalizing the consumption of local peasants and indigenous population, particularly in, but not restricted to, the several protected areas in the Chaco Region (e.g. in the departments of Copo, Bermejo, General Güemes, Anta). As a result, changing household consumption of firewood is influenced by demand (due to necessity) and supply (access to forestland) focussed factors. In the next sections, we will go more into detail on regional settings and contexts within the NAC to be able to highlight sub-regional development patterns at hand. The NAC is not a homogeneous area. The evolution of the supply and consumption of firewood of each of the 17 departments under study over the last 20 years is represented in the Figure 3A. The different trends observed permit the classification in four different realities (Figure 3B) that are mapped in Figure 3C. NAC classification: Consumption of firewood for cooking and supply (available forestland). Data sources: INDEC (1991, 2001, 2010); Landsat™ (1991–1992, 2001–2002, 2007–2011). NAC-Region I covers 32% of the NAC, spans over seven departments and is densely populated (6.04 inhabitants per km² in 2010), with highly urbanized area. This region represents the NAC’s major soy-production area, which is reflected in the high percentage of deforested area (of one third of the overall surface), as well as the enormous forest clearing rate (14.8%) from 2001 to 2010. Consolidated agricultural activity prior to the study period: Particularly the southern part of this region (Cruz Alta, Burruyacú, Rosario de la Frontera, Metán) and Orán in the north have a long-standing tradition of horticulture, beans, citrus, and sugar crops. The use of land, as a result, is coupled with activities carried out on already deforested areas. Thus, the major effects of land use change and transformation have happened before the study period. During our study period, the region experienced a substitution of the major harvested crops (i.e. towards soybeans), significant changes in methods of production to direct sowing, and change the market orientation, favouring global markets. Newly deforested areas used for large-scale agriculture: Especially in the departments of Anta and Patiño, new productive nuclei as replacement to forest land have formed over the last two decades. The transformation is being driven by agribusiness enterprises. Newly transformed land is destined to soybean production in Anta, and mainly to cattle ranching in Patiño. Major environmental changes with socio-ecological effects on the local communities have occurred over a short period of time. Thus, the time for locals’ adaptation has been significantly shorter than in a) above. Overall, the transformative dimension is much more visible here, since the advancement of the agribusiness has been seen most in this area. When analysing the data with focus on the energy ladder, positive developments are seen. The integration of the region in the global economy leads to increased income of some local actors involved in the agribusiness, which allows changing the basic source of energy from firewood to more efficient ones, promoting “progress”, and alleviating energy poverty situations. However, including a comparative analysis of the CMRM from 1999–2003 to 2004–2008, living conditions for the majority of the population deteriorate even though the region’s infrastructure and accessibility has improved significantly. The NAC-Region II takes us to more rural areas, with a density of 1.71 inhabitants per km2 in 2010. This region covers 45.5% of NAC, and still has large-scale forest areas (86% of the surface is covered by trees). Agrarian productive forces have not touched ground like in NAC-region I. Intensive cattle breeding (in pastures or feed lots), however, is expanding rapidly, going along with soybean production in departments like General J. de San Martin. In the study period the agrarian expansion has been continuous; the last decade however shows higher growth rates. Bearing this information in mind, the core characteristic within this region is the counter-trend increase of firewood consumption in crisis situations. This is particularly relevant during the major national crisis in 2001 with unemployment rates soaring and the Argentine Peso plummeting. Locals step down the energy ladder and use the forest to satisfy their energy needs, thus saving money. This situation is a clear safety net situation (cf. Angelsen and Wunder 2003). In the wake of economic crises or ecological disasters, the forest contributes to maintaining the livelihood of the households until it is possible to leave one’s precarious situation. Having the opportunity to rely on the forest in special situations, people living in this region are offered greater choice in composing their livelihoods portfolio. Interestingly, coupled with this development, the demand for firewood is declining in the post-crisis era, dropping below the level of 1991. As a result, the movement on the energy ladder is in fact bidirectional. Stepping down the ladder is not necessarily negative; the use of (free) firewood is rather a vital component in coping strategies of locals. This is – unlike in NAC-Region I – possible due to still largely available forest surface. Furthermore, the fact that the energy source is not externally conditioned, but the decision of energy source is individual is also being reflected in the CMRM: It dropped from 1.30 in 1999–2003, to 0.72 in 2004–2008. NAC-Region II has thus shown the greatest improvements of living conditions of all regions under analysis. Decision-making power on the type of energy source used contributes to households’ coping strategies in crisis situations. While the two previous regions have already experienced significant levels of agricultural development, NAC-Region III and IV are the two northernmost and remote regions of our study area, and they have not yet been fully incorporated in the new agribusiness model. Another characteristic of regions III and IV is the high percentage of peasants and indigenous population; different conceptions of land use and ownership between occidental and indigenous thought styles provoke legal uncertainties in the region. For example, conflicts of land use and ownership, such as in the case of fiscal territory 55 and 14 in Salta (cf. Gobierno de la Provincia de Salta 2014), highlight the altered level of vulnerability of locals, since land grabbing examples of businesses involved in land speculation and deforestation are increasingly observed (Gras and Sosa-Varrotti 2013; private communication Secretaría de Ambiente 2014). Modifications of rules as well as increased pressure on legal and administrative bodies in terms of land use and ownership is thus a burning issue (private communication Secretaría de Ambiente 2014). Actor’s pressure towards clear-cut situations on land tenure and use is increasing. While the above mentioned characteristics apply both to NAC-Region III and IV, certain particularities and differences are observed: NAC-Region III covers 17% of the overall Argentine Chaco, but comprises only two departments. Still largely untouched by deforestation (96.5% of the category’s surface is still covered with trees), this region, shows significant differences to the others: First, and most striking, in absolute numbers, the consumption for firewood is constantly increasing (from 1990 to 2010, 41% more people rely on firewood as a heat source for cooking). The necessity for locals to have access to the forest is crucial for their livelihoods. Second, in terms of the safety-net discussion, NAC-Region III is strongly dependent on derivatives of forestland and cannot offer the characteristics of choice as described in NAC-Region II. Access to combustion higher up on the energy ladder is very limited; natural gas pipelines do not exist and liquefied petroleum gas is often – due to their already economically precarious living situation – out of reach. Global or national influences, particularly the global-local interplay on local livelihoods still play a minor role; the connection to the physical environment is a crucial factor. Continuing this line of thought, while the current system of firewood use for cooking is well-established in the region, future expansion of agribusiness towards the region and thus deforestation leads to high pressure on both the forest and on the availability of the majority’s primary source of combustion. Based on those regional bio-physical changes in the region, and viewed from a locals’ point of view, “latent vulnerability” is observed: The threat of losing a major source of (cheap) combustion and thus one significant part of livelihoods’ assets is already present but has not been fully materialised. To highlight this aspect even further, living conditions have deteriorated in the study period. Taking again an indicator for living conditions, the CMRM has already been one of the highest in the overall Argentine Chaco and Argentina as a whole. In the study period it has increased by 21% to 6.7 deaths per 1000 children. Including potential agribusiness expansion in the region, NAC-Region III becomes a particular hotspot for future conflict and even higher vulnerability. Much like in the previous category, NAC-Region IV belongs to the poorest areas in Argentina, with high levels of indigenous population (such as Wichí or Qom), and conflicts on irregularities of land tenure as well as remoteness to agriculturally productive areas. Regional transport infrastructure is still lacking, as the example of the National Route 81, connecting the eastern and western part of the region, shows: It has been paved only in the year 2008. This region, once again comprising two departments and has a share of 10.3% of the overall NAC study area with forest coverage of 97.8% in 2010. The main distinguishing feature here is the status-quo of regional development. So far, we stipulate that issues of land transformation and modification of rules only occur on a very small scale and are thus not yet visible. This aspect has been seen in NAC-Region III as well. However, one major difference appears: NAC-Region IV does not show an increase in the number of firewood users. In fact, considering relative numbers, the percentage of firewood users is decreasing (as shown in the next section 3.4). Given that in both NAC-Regions the forest area remains intact, the difference in consumption could be explained by considering the evolution of social indicators. In NAC-Region IV the CMRM – though still being very high (in 2004–2008 it ranks among 6.5) – has decreased by 30%, reducing resource dependency. Besides the categorization of the NAC, another objective of this paper is the visualisation of future trends in consumption and supply of firewood in the NAC. We base our analysis on the extrapolation of territorial process of the last two decades including government planning and policies. In so doing Figure 4A shows the relative development of the two variables: consumption and supply of firewood. Pathways of NAC-Regions’ firewood supply, consumption, and forest zoning. Considering consumption, all NAC-Regions are decreasingly dependent on firewood, but each region offers a different standing and starting point in 1991. For example, when more than 90% of NAC-Region III’s population was still using firewood, in NAC-Region I this value did not exceed 30%. Simultaneously, taking into account supply of firewood, there is a steady loss of forest area in each NAC-Region. However, we can find marked differences between them: While in 2010 65% of the NAC-Region I was covered by forests, this figure remained over 95% in NAC-Regions III and IV. The most interesting issue here is the succession of trends among the regions. In the course of 20 years, NAC-Region III has moved towards the starting point of II, while II and IV have moved towards the starting point of I. This is interpreted as an evolutionary development in the NAC that we call socio-forest transition path. It begins with a stage of high dependency and use of forests by local populations, towards a step of greater use of the territory by global players, deforestation, and increased restrictions on access to and use of CPRs. The speed of change in the different NAC Regions and the possibility to complete (or not) what we call socio-forest transition, are related, for us, with this indissociability of the comprehension of historical phenomena and their spatial correlation (Braudel 2001 ). In this sense, considering the socio-ecological characteristics of the different NAC Regions and, as we discussed above, the possible future trends in view of the recent forest policies, we can project where territorial transformations are most likely in the forthcoming years. In doing so, we include the forest zoning map compiled by the respective provinces in accordance to the Forest Law (Figure 4B). According to legislation demands (cf. chapter 1.2 above) the forest zoning maps categorize the territories with three colours (red, yellow, and green), which represent their conservation value. Thus, and as the figure shows, NAC-Region I and IV will be most affected since the majority of the surface of both is in green colour, allowing total transformation of the forest. The trend in both NAC-Regions is a mayor intensification of the production, both of agriculture and cattle ranching. Further, in the case of NAC-Region IV, where a high percentage of population is still relying on firewood, this development will raise major difficulties for locals. Meanwhile, NAC-Regions II and III are mostly in yellow zonings. The transformation of forest to productive activities is allowed while forest cover should be maintained. Initially, this category was designed to encourage and enable the development of forestry and pastoral activities traditionally carried out by the rural population. However, a new type of deforestation, locally known as “desbarejado”, where the law is respected due to maintenance of 20% of the forest cover, is expanding. Yet, the understory is removed, and it is implementing intensive livestock pastures decreasing the access of locals to firewood. Finally, the areas in red (i.e. dedicated to forest conservation) in all NAC-Regions are only few areas that cover river banks and national parks (where deforestation was already banned before the Forest Law), adding in this category also a few indigenous territories and communal lands, in the case where the communities could press to keep their lands free of the deforestation threat. 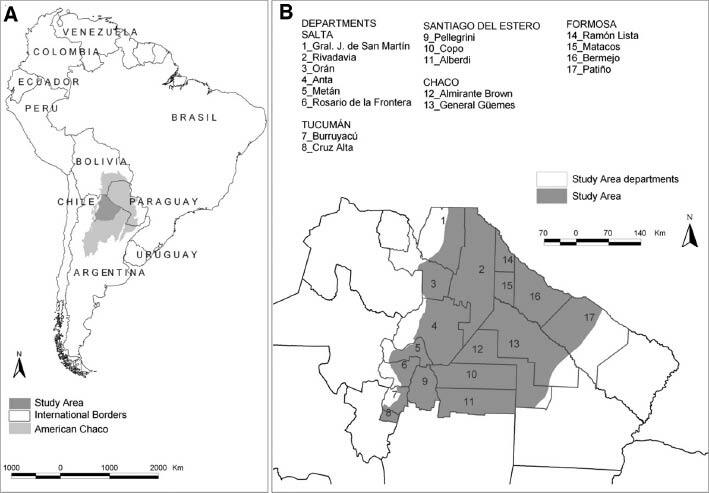 In this paper we have analysed the case of the evolution of consumption and supply of firewood in the NAC, the heart of soybean expansion on native forests in Argentina. The results show a wide variety of situations within such a heterogeneous region. Nevertheless, we identified four major trends in the last 20 years: I) Drastic declines of consumption and supply of firewood in the major soy-production area of the NAC; II) use of firewood as a safety net in departments where agribusiness and intensive cattle ranching are becoming significant; III) rise of firewood users in areas of increased poverty; IV) maintained levels of consumption and supply of firewood in poor regions outside globalised markets. However, considering relative numbers, a main tendency was also identified in the NAC: a marked trend towards low consumption and supply of firewood. 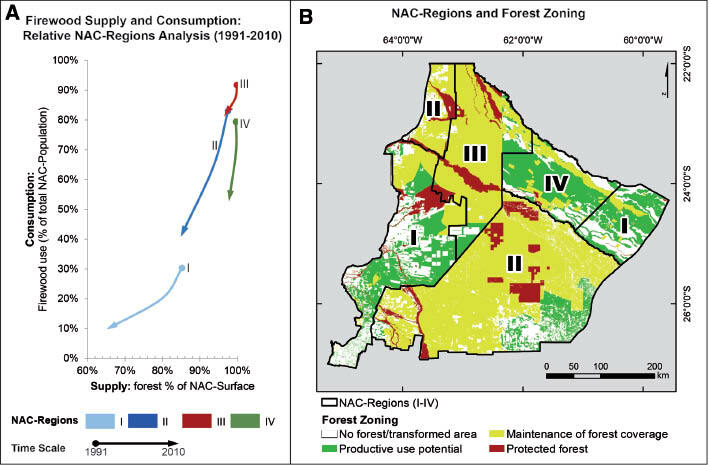 The observation of this trend we call socio-forest transition, as well as the analysis of forest zoning maps, allow the prediction of the intensification of the agribusiness model in the NAC. The starting point, understanding that each NAC Region not only has certain physical/natural characteristics, but also has different historical, political-economic and cultural processes, and are inhabited by different social groups with different valuations of the territory and its resources, allowed us to analyse the different time scales and speeds of territorial changes. In this sense, it is no coincidence that the rates of change are faster in the more dynamic, urbanized and incorporated into the capitalist market logic regions. In this way, the approaches from the geo-history, especially Braudel’s (2001) and Haesbaert’s (2002) contributions, were key to this analysis. Moreover, the exercise to regionalize and “cut” the territory has not been decoupled from the identification of the different stages of change, different historical moments that each NAC region is starring, returning to intersect the categories of time and space. Additionally, contrasting energy ladder strategies among different NAC-Regions are identified. In this regard it is important to highlight how rise on the energy ladder in the NAC (i.e. cleaner energy consumption) has not always been accompanied by improvements in living conditions, as might be expected according to the theoretical model. Furthermore, the fluctuations in the evolution of firewood consumption in vulnerable areas, where the agribusiness is aggressively expanding, lead us to the interpretation that the access to firewood as a safety net (i.e. a quick money-saving energy solution in times of crisis) is of great importance. In large areas of Latin America in the last decades the agribusiness expanding are threatening access to CPRs of which depends the survival of local populations. In this context we argue that the territorial transformations and rule modifications (that affect populations and are manifested in many conflicts), have effects on the supply of firewood for the households, which restrict their energy alternatives, and hence their livelihood levels. And vice versa, the deteriorated livelihood levels of the local populations (particularly, in the case of impoverishment situations) are also evident in a greater reliance on CPRs. Finally, it is necessary to highlight the key role of government policies defining territorial processes. It comes without saying, and is also a result of our research that alternatives of local actors can be reduced and/or enlarged in turn by the state’s role. A deeper analysis of the scope and implications of the state policies in the NAC and how they enable and restrict opportunities for local actors remains pending. In forthcoming studies it is essential to focus on the local level, in order to understand the local political dynamics, that concern the territories and are invisible on others scale of analysis. Yet, the results presented in this paper will allow the planning of strategies for the territories that are still outside of the agribusiness model or going through the process of territorial transformations. Thus, based on our results, possible effects on households and their livelihoods can be anticipated. 1In Argentina, the use and protection of forest resources are regulated by different norms, among which stands out especially the Forest Law (N. 26,331), which was enacted relatively recently (in 2007). In the province of Salta agricultural enterprises were able to circumvent this law by “special adaptations” to the protective map zoning of forest land (Schmidt 2014). 2Previous regulations such as Law No. 13.273 (1948) regulating the use of resources by establish-ing the mandatory to users to submit management plans. Also the law established conservation criteria according to a classification of wealth forests that came not to be applied in practice (Minaverry and Martínez 2009). The authors appreciate the financial fieldwork support by the National Council of Scientific and Technical Research (CONICET) [PIP 2011–2013 0073], Argentina’s National Agency of Science and Technological Research [PICTO 2011 no. 0098], the Conservation Found of the Argentina Galicia Bank [FOCA program 2011], and Marietta Blau grant of the Austrian Agency for International Cooperation in Education and Research (OeAD-GmbH). Agrawal, A (2007). Forests, Governance, and Sustainability: Common Property Theory and its Contributions. International Journal of the Commons 1(1): 111–136. Altrichter, M and Basurto, X (2008). Effects of Land Privatization on the use of Common-pool Resources of Varying Mobility in the Argentine Chaco. Conservation and Society 6(2): 154–165. Angelsen, A and Wunder, S (2003). Exploring the Forest-Poverty Link: Key Concepts, Issues and Research Implications. CIFOR Occasional Paper, N° 40. Araghi, F (2010). Accumulation by Displacement: Global Enclosures, Food Crisis, and the Ecological Contradictions of Capitalism. Review: A Journal of Fernand Braudel Center 34(1): 113–146. Bailis, R, Chatellier, J. L and Ghilardi, A (2012). Ingram, J. C, DeClerck, F and Rumbatitis del Rio, F. C eds. Ecological Sustainability of Woodfuel as an Energy Source in Rural Communities. Integrating Ecology and Poverty Reduction: Ecological Dimensions. New York: Springer. Barnes, D. F, Krutilla, K and William, H (2005). The Urban Household Energy Transition: Energy, Poverty, and the Environment in the Developing World. Washington, DC: Resources for the Future. Borras, S. M Jr., Kay, C, Gómez, S and Wilkinson, J (2012). Land Grabbing and global Capitalist Accumulation: Key Features in Latin America. Canadian Journal of Development Studies 33(4): 402–416. Braudel, F (2001). El Mediterráneo y el mundo mediterráneo en la época de Felipe II. Madrid: Fondo de Cultura Económica. Calzada, J (2015). En diez años se duplicó la liquidación de divisas por las exportaciones agrícolas. Bolsa de Comercio de Rosario, Informativo Semanal 1691, año XXXII. http://www.bcr.com.ar/Pages/Publicaciones/Boletin.aspx. Carrasco, M and Briones, C (1996). La tierra que nos quitaron. Reclamos indígenas en Argentina. Copenhague: IWGIA. Cervera-Novo, J. P (2010). La cuestión indígena en la Argentina, un estudio de actualización. Buenos Aires: Ministerio de Agricultura, Ganadería y Pesca de la Nación. D’Alisa, G (2013). Bienes comunes: las estructuras que conectan. Ecología Política 45: 30–41. DeFries, R and Pandey, D (2010). Urbanization, the Energy Ladder and Forest Transitions in India’s Emerging Economy. Land Use Policy 27(2): 130–138. Démurger, S and Fournier, M (2011). Poverty and Firewood Consumption: A Case Study of Rural Households in Northern China. China Economic Review 22(4): 512–523. Dinerstein, E, Olson, D. M, Graham, D. J, Webster, A. L, Primm, S. A, Bookbinder, M. P and Ledec, G. A (1995). Conservation Assessment of the Terrestrial Ecoregions of Latin America and the Caribbean. Washington, DC: The World Wildlife Fund and The World Bank. Esper, N (2001). Estudio de casos sobre combustibles forestales. (GCP/RLA/133/EC). Estado de la Información Forestal en Argentina, Proyecto Información y Análisis para el desarrollo forestal sostenible. FAO. FAO. Unified Wood Energy Terminology: UWET, [Online]. Available http://www.fao.org/docrep/008/j0926e/j0926e00.htm[Visited on 2014, December 10]. García-Collazo, M. A, Panizza, A and Paruelo, J. M (2013). Ordenamiento Territorial de Bosques Nativos: Resultados de la Zonificación realizada por provincias del Norte Argentino. Ecología Austral 23(2): 97–107. Gasparri, N. I, Grau, H. R and Manghi, E (2008). Carbon Pools and Emissions from Deforestation in Extra-Tropical Forests of Northern Argentina between 1900 and 2005. Ecosystems 11(8): 1247–1261. Gasparri, N. I, Grau, H. R and Gutiérrez-Angonese, J (2013). Linkages between Soybean and Neotropical Deforestation: Coupling and Transient Decoupling Dynamics in a Multi-Decadal Analysis. Global Environmental Change 23(6): 1605–1614. Geist, H. J and Lambin, E. F (2002). Proximate Causes and Underlying Driving Forces of Tropical Deforestation. BioScience 52(2): 143–151. Gobierno de la provincia de Salta. Urtubey transfirió la propiedad de los lotes fiscales 55 y 14 a originarios y criollos luego de 20 años, Online. [Visited on 2014, December 10] http://www.salta.gov.ar/prensa/noticias/urtubey-transfirio-la-propiedad-de-los-lotes-fiscales-55-y-14-a-originarios-y-criollos-luego-de-20-anios/31321. Goldfarb, L (2012). The frontiers of genetically modified soya in Argentina. Posession, rights and new forms of land control and land governance. International Conference on Global Land Grabbing, II October 17–19, 2012 Ithaca, NY. http://www.cornell-landproject.org/download/landgrab2012papers/goldfarb.pdf. Gordillo, G (1995). Después de los ingenios: la mecanización de la zafra salto-jujeña y sus efectos sobre los indígenas del Chaco centro-occidental. Desarrollo económico 35(137): 105–126. Gras, C and Sosa-Varrotti, A (2013). Gras, C and Hernández, V eds. El modelo de negocios de las principales mega-empresas agropecuarias. El Agro como Negocio. Producción, sociedad y territorios en la globalización. Buenos Aires: Ed. Biblos. Grataloup, C (2006). Os períodos do espaço. GEOgraphia 8(16) http://www.uff.br/geographia/ojs/index.php/geographia/article/view/198/190. Haesbaert, R (2002). Territorios Alternativos. Sao Paulo: Contexto. Hansen, M. C, Potapov, P. V, Moore, R, Hancher, M, Turubanova, S. A, Tyukavina, A, Thau, D, Stehman, S. V, Goetz, S. J, Loveland, T. R, Kommareddy, A, Egorov, A, Chini, L, Justice, C. O and Townshend, J. R. G (2013). High-Resolution Global Maps of 21st-Century Forest Cover Change. Science 342(6160): 850–853. Hosonuma, N, Herold, M, De Sy, V, De Fries, R. S, Brockhaus, M, Verchot, L, Angelsen, A and Romijn, E (2012). An Assessment of Deforestation and Forest Degradation Drivers in Developing Countries. Environmental Research Letters 7(4): 044009. Jones, R. H (2010). Energy Poverty: How to Make Modern Energy Access Universal?. Special early excerpt of the World Energy Outlook. Paris: International Energy Agency/OECD. Leake, A (2010). Los pueblos indígenas cazadores-recolectores del Chaco Salteño: población, economía y tierras. Salta: Fundación ASOCIANA, Instituto Nacional de Asuntos Indígenas, Universidad Nacional de Salta. Legros, G, Havet, I, Bruce, N and Bonjour, S (2009). The Energy Access Situation in Developing Countries: A Review Focusing on the Least Developed Countries and Sub-Saharan Africa. New York: World Health Organization and United Nations Development Program. León, C, Prudkin, N and Reboratti, C (1985). El conflicto entre producción, sociedad y medio ambiente: la expansión agrícola en el sur de Salta. Desarrollo económico 25(99): 399–420. Longhi, F (2014). Desnutrición y Muerte en la Niñez argentina en los Albores del Siglo XXI: Un Análisis Espacial. Journal of Latin American Geography 13(2): 41–65. Luna, E (2010). Estudio exploratorio del uso de la leña en escuelas rurales de la provincia de Santiago del Estero, Unpublished thesis dissertation. Universidad Nacional de Santiago del Estero. Maass, J. M, Balvanera, P, Castillo, A, Daily, G. C, Mooney, H. A, Ehrlich, P, Quesada, M, Miranda, A, Jaramillo, V. J, García-Oliva, F, Martínez-Yrizar, A, Cotler, H, López-Blanco, J, Pérez-Jiménez, A, Búrquez, A, Tinoco, C, Ceballos, G, Barraza, L, Ayala, R and Sarukhán, J (2005). Ecosystem Services of Tropical Dry Forests: Insights from Long Term Ecological and Social Research on the Pacific Coast of Mexico. Ecology and society 10(1): 1–23. Mamo, G, Sjaastad, E and Vedeld, P (2007). Economic Dependence on Forest Resources: A Case from Dendi District, Ethiopia. Forest Policy and Economics 9: 916–927. Mulenga, B. P, Richardson, R. B, Tembo, G and Mapemba, L (2014). Rural Household Participation in Markets for Non-Timber Forest Products in Zambia. Environment and Development Economics 19: 487–504. Murgida, A. M (2013). Cambios socio-ambientales: desplazamientos de las poblaciones históricamente postergadas en el Chaco-salteño. Cuadernos de Antropología 9: 35–63. Ostrom, E, Gardner, R and Walker, J (1994). Rules, Games, and Common-Pool Resources. Ann Arbor: Univ. of Michigan Press. REDAF [Red Agroforestal Chaco Argentina]. Conflictos sobre tenencia de tierra y ambientales en la región del Chaco argentino. 2° informe, datos relevados hasta Agosto de 2010. Reconquista, Chaco. http://redaf.org.ar/wp-content/uploads/2009/04/Conflictos-de-Tierra-y-Ambientales-datos-relevados-hasta-Agosto-2010.pdf. Regunaga, M (2010). The Soybean Chain in Argentina. Implications of the Organization of the Commodity Production and Processing Industry Case Studies. Washington, DC: World Bank, Latin America and the Caribbean Chief Economist Office. Rehfuess, E (2007). Energía doméstica y salud: combustibles para una vida mejor. Ginebra: Organización Mundial de la Salud. Schmidt, M (2014). (Des)ordenamientos territoriales salteños. Una aproximación al contexto previo al Ordenamiento Territorial de Bosques Nativos en la provincia de Salta. Mundo Agrario 15(28) http://www.mundoagrario.unlp.edu.ar/article/view/MAv15n28a12. Seghezzo, L, Volante, J, Paruelo, J, Somma, D, Buliubasich, E, Rodriguez, H, Gagnon, S and Hufty, M (2011). Native Forest and Agriculture in Salta (Argentina): Conflicting Visions of Development. The Journal of Environment and Development 20(3): 251–277. Soltani, A, Angelsen, A and Eid, T (2014). Poverty, Forest Dependence and Forest Degradation Links: Evidence from Zagros, Iran. Environment and DevelopmentEconomics 19(5): 607–630. Sovacool, B. K (2012). The Political Economy of Energy Poverty: A Review of Key Challenges. Energy for Sustainable Development 16: 272–282. Teubal, M (2009). Akram-Lodhi, H. A and Kay, C eds. Peasant Struggles for Land and Agrarian Reform in Latin America. Peasants and Globalization. Political Economy, Rural Transformacion and the Agrarian Question. Londres: Routledge. Yevich, R and Logan, J (2003). An Assessment of Biofuel Use and Burning of Agricultural Waste in the Developing World. Global Biogeochemical Cycles 17(4): 1095.